Find the best forklift drum handler for your drums. 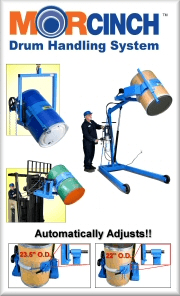 Choose the correct forklift drum handler to lift and pour a drum, or a forklift drum lifter and move upright drums. Transport a 1500 Lb. (680 kg) upright rimmed steel, fiber or plastic drums with your forklift. Lift and move a 1000 Lb. (454 kg) upright rimmed drum with your forklift. Lift, tilt and rack a 55-gallon (210 liter) rimmed steel or plastic drum with your forklift. with your Morse forklift drum handler. Applicable OSHA Regulations and Calculation of Lost Load Capacity when using Morse forklift attachments for handling drums. Morse forklift drum handlers - Forklift attachments to lift, move and pour drum.